On Tuesday, June 14, Open Road Media and MysteriousPress.com will release eight e-books toward what will eventually become the complete Collected Case Files of the Continental Op, edited and presented by Hammett’s biographer Richard Layman and his granddaughter Julie M. Rivett. 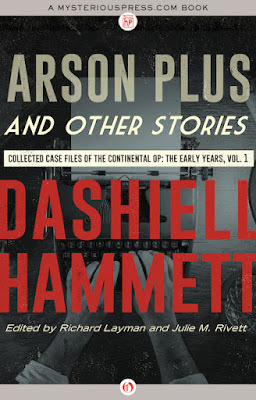 As Rivett notes in her foreword, the series marks “the first electronic publication of Dashiell Hammett’s collected Continental Op stories to be licensed either by Hammett or his estate—and the first English-language collection of any kind to include all twenty-eight of the Op’s standalone stories.” Additionally, the complete series will include the never-before-published “Three Dimes,” a fragment of an Op story from the Hammett archive. Rivett and Layman have worked together on many projects, including The Hunter and Other Stories, Return of the Thin Man, The Selected Letters of Dashiell Hammett: 1921-1960, and Dashiell Hammett: A Daughter Remembers. Rivett speaks widely about her grandfather’s work and legacy, and I’m honored to welcome her to SleuthSayers to discuss this landmark project. ART TAYLOR: Hammett’s characters Sam Spade and Nick and Nora Charles have surely entered the wider cultural consciousness more completely, but the Continental Op might arguably be the more seminal character in terms of the development of the genre. What do the Op and his stories offer crime fiction readers that The Maltese Falcon, for example, doesn’t? JULIE M. RIVETT: The Op is important and, yes, seminal. 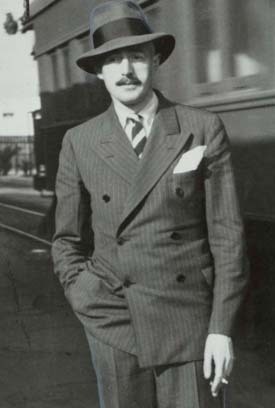 Ellery Queen said he could have been Sam Spade’s older brother, equally hardbitten, but with perhaps less spectacular presentation. The Op’s narratives are workmanlike, realistic, and procedurally detailed. His plainspoken wit is at least as dry as Spade’s. It’s a shame he’s not memorialized in film the way that Sam and Nick and Nora are. I think that’s the main reason the Op is less well known to contemporary readers. One of other the big differences between the Op and Spade, Nick, and Ned Beaumont is that he’s a company man, on the payroll for the Continental Detective Agency, modeled on Pinkerton’s National Detective Agency, where my grandfather worked for some five years, off and on. Spade and Nick Charles are independent sleuths. Ned Beaumont functions as a detective, but in fact he’s a political operator inadvertently entangled in a murder. Professional standpoint makes a difference in how each one perceives his professional obligations. The Op is the only one who has to answer to a boss, the Old Man. He fudges his reports at times to cover up some less than conventional tactics, but, still, he’s loyal to the Agency and he loves his job. Or he is his job. That idea of profession as identity runs all through my grandfather’s work. The Op tales offer an extended narration of workaday professionalism in action. Several collections in recent years have featured Continental Op stories, notably 1999’s Nightmare Town and then more extensively the Library of America’s Crime Stories & Other Writings in 2001, but this is the first time all of the standalone Op stories have been gathered together in series form. What might readers learn about the Op or about Hammett—and what did you yourself take away—from reading these complete case files, finally gathered in chronological order? Any careful reader will see the progression in Hammett’s work. The stories grow longer and more fluid, the Op more emotionally vulnerable, the resolutions keyed more to justice than law. There’s evidence of both character and story development. Rick does a good job in his introductions of describing shifts in the degrees of violence that take place under Hammett’s three editors at Black Mask—very little under George W. Sutton, with scanty gunplay; much more under Philip C. Cody, the Op tempted to go blood simple; and ample well-developed action under Joseph Thompson Shaw, purposeful as well as thrilling. I’m drawn to that biographical potential of the collection, of course. The complete run of stories offers a fascinating opportunity to contextualize the Op’s narratives within Hammett’s real life story. My grandfather starts with a novice’s attention his editors’ demands—thrilled to be published, but also intent on keeping food on the family table. He hits his stride with some great stories, but then there’s a break, when he walks away in anger, deciding to give up on fiction. Then he’s back, with stories more confident, complicated, and ambitious. He’d realized his talents and was ready (with Joseph Shaw’s support) to challenge pulp- and crime-fiction norms. And then the sea change in February of 1930—the final Op story published in Black Mask, the same month that The Maltese Falcon was released by in hardback by Knopf. With that, my grandfather was done with the Op and off to explore other possibilities. A few of the Op stories have been elusive except in much older editions—“It” and “Death and Company,” specifically. Why have those not been republished more recently, and do you anticipate they will be among the standout gems here for readers who are already fans? The Op’s publishing history is complex—even frustrating. I don’t know why those two stories have been overlooked for so long. There is a gruesome tinge to each, but nothing sufficient to repel Hammett readers. I certainly can’t explain Lillian Hellman’s choices while she controlled the estate or the decisions made by her former trustees after her death. I do know that contracts let under their tenure made the publication of Complete Case Files extraordinarily difficult. It seemed ridiculous to me that the Op’s tales couldn’t be collected altogether! Rick and I are both current trustees for Hammett’s literary property trust (under Hellman’s will, no less) and even with that, it was a struggle to assemble all the pieces. We’re hugely pleased and proud of that we were, finally, able to bring together the Op’s complete short-story canon. “It” and “Death and Company” were last available, alongside many other Op stories, in paperbacks edited by Ellery Queen between the early 1940s and early ’50s [the cover to one of those paperbacks can be seen at left]—but you note that the stories in those editions were presented in “sometimes liberally re-edited form.” [Editorial note: Don Herron at “Up and Down These Mean Streets” has been less diplomatic, using the word “butchered,” and Terry Zobeck has meticulously charted the editorial changes to “Death and Company” here.] In the newly collected case files, do you and Layman restore these and other stories to their original form? Does each of the eight volumes feature its own individual introductions by you and Richard Layman? Rick and I have worked together since 1999 and this is our fifth published collaboration. We’ve learned to divvy up the editorial tasks. Each book has had its own rewards and challenges. In this case, in addition to constraints imposed by previous contracts, we’re negotiating the relatively new world of e-publication. It’s complicated. For now, we’re releasing eight volumes, which include 23 stories. We hope to release the remaining handful and the fragment later this year. “Three Dimes” promised to be a real highlight of the collection here. What more can you tell us about it? The fragment comes from Hammett’s archive at the University of Texas at Austin. It is unique—a 1,367-word partial draft, in the classic Op style, that leaves us wondering what would have happened next and why the story was set aside unfinished. My grandfather, who saved very little, saved this, along with chapter and character notes, which will be included. I think that rare glimpse of Hammett’s process is going to be a real thrill for fans. Watch for it! Find out more about the Complete Continental Op here at Open Road Media. Great interview, Art. And thank you, Julie, for giving us the inside scoop on the upcoming volumes and grandfather! Great stuff. And I have to say that I really like the Continental Op stories, and look forward to seeing the ones that have been out of circulation for a while. Thanks, Paul! Appreciate the comment here and glad you enjoyed the interview. I was lucky to get a preview of one of the volumes, and it's really nicely done--and the foreword and introduction are illuminating. Very excited about the other volumes myself! This is a wonderful topic, and a good interview, Art. I'd love to see more film and TV treatments of the Op. There have been various takes on Red Harvest, with Bruce Willis and Clint Eastwood, but I'd like to see the stories done in a consistent manner--like the BBC/Mystery treatments of Sherlock Holmes or Inspector Maigret. No question this author inspired me to write. The Thin Man, particularly (love the book, as well as the movie.) His spare dialogue-centred writing was something I strove for. And now I want to read them all again! Including Cont. Op. I've taught the Op story "The Gutting of Couffignal" and the Op novel Red Harvest several times at Mason, but recently went back and reread all the novels again myself--such a pleasure to revisit them! I always loved Dashiell Hammett. I look forward to getting the complete collection of Continental Op stories! Thanks, Eve--and I'm looking forward to YOUR new story in AHMM! Great to see your name on that fun cover! Great column, Art, as usual. I too am a Hammett fan, and I've enjoyed most of the Continental Op's ops. Interesting interview!! Thanks, John! I'm looking forward to revisiting them and to reading the ones I haven't read before. Brilliant, Julie and Art. I stumbled upon the Continental Op when I was a kid and became forever hooked. I loved those stories and hearing the background. Thanks! Thanks, Leigh! I was off-line much of the weekend (high school reunion, book events, and family time) but so much appreciate the comment here. Thanks to everyone for the feedback and enthusiasm! Art and Julie, great interview on a long-overdue subject. I have been an Op fan for many years. Over those years I have collected all of the Op stories (except "Three Dimes") from various sources. I have read them all at least twice and enjoyed them each time. Recently all of these e-books were collected and published as The Big Book of the Continental Op, which I purchased as soon as it came out. I am now re-reading these stories and enjoying them all over again. Terrific interview with Julie. I had the pleasure of meeting her and Rick and her mother Jo at the Washington Bouchercon in 2001 for their launch of Jo's memoir of her father. Probably the highlight of my book life. Over lunch I lobbied them for a comprehensive collection of Hammett's short stories--too many remained easily available to readers. They sympathized with me but explained that the contractural complexities precluded such a volume. Last year's print version of the Complete Op stories goes a long way toward rectifying the problem. I also lobbied them to publish the unpublished stories archived at UT-Austin. I was thrilled several years later when she and Rick edited The Hunter and Other Stories. This was something I was hoping for ever since Bill Pronzini told me of their existence more than 20 years ago. Thanks for the plug for my series of posts on Don Herron's Up and Down These Mean Streets site comparing Hammett's original texts to the edited versions done by Fred Dannay. It's been a while since I posted there but I still plan to finish the assessment of all of Hammett's stories reprinted by Dannay. Thanks, Terry! Good to know some background here on those conversations and your encouragement that they publish these stories. And for your fine work overall—a pleasure to read! Damn Right, there's ME in my Characters! Warning! There's a Storm Coming! One More Thing: Is Columbo America's Sherlock?